Field service businesses already recognize the importance of having knowledgeable, friendly, and trustworthy field technicians to provide exceptional customer service. But not all have recognized the link between implementing a service management system – such as Acumatica’s Field Service Edition – that gives technicians continuous access to your business information and customers’ histories via any mobile device and increased sales. To stay competitive, this is the time to implement field service management software and equip your field technicians, and your business, for success. Have you realized there is untapped potential in your field service personnel regarding increasing sales for your field service organization? If not, I will explain where that potential exists and what you must do first to utilize it. However, before I do, I encourage you to read these previous posts to learn about Field Service Management (FSM), the major benefits of field service software implementation, and the important questions you should ask a potential FSM software provider. What do I need to do before my field technicians assist in increasing sales? I’m glad you asked and it’s related to the previous posts I suggested you read. As defined in one of those earlier posts, Field Service Management is simply managing your company’s resources and work force – who are deployed in offsite locations – using mobile field service software. Before you can encourage your field representatives to recognize the areas of revenue opportunity available to them, you must first implement mobile field service software. Implementing this software is the first step because your personnel are the face-to-face contacts for your customer, building rapport and trust at the ground level. Your onsite technicians must have the ability to connect to your business at all levels – from inventory reports to dispatch to a customer’s full data – to foster that relationship. Moreover, not only must they have access to this information and a direct link to dispatch, they must also be able to access it all from any location at any time from any mobile device to meet customers’ expectations of timely and knowledgeable service. This also allows your business to competitive in your industry. Because of this need, your company requires a cloud-based, mobile ERP with field service management software. Acumatica provides just such a Field Service Edition; it works with CRM, sales, inventory, purchasing, accounting, and financial reporting – a must for every growing field service business. “…every employee can get access to ERP data, from wherever they are when they’re traveling. Our customers can get access to ERP data. We’ve never had the capability to offer this before we had Acumatica. That is definitely a big plus for us,” says Senior Project Manager Darren Wilson of PracticeMax, referencing their ability to share data through the cloud. With over 31 years of experience, PracticeMax provides business management and information technology solutions to a diverse mix of health care providers focusing on billing, coding, compliance, contracting, surveys, and marketing. The company processes over 2,400,000 patient/provider encounters and generates billings of over $1.6 billion per year. Rapid growth caused them to quit QuickBooks as their accounting software and begin the search for an ERP system. They needed enhanced financial reporting, cost-effective system expansion, and a comprehensive picture of their customer’s needs. 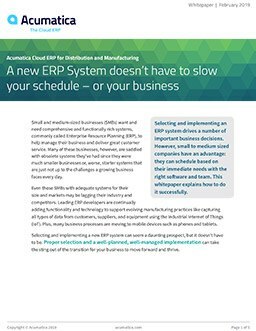 They chose Acumatica – and the fact that we are a cloud-based, mobile ERP made the choice that much better for their company. PracticeMax selected Acumatica over SAP and Oracle because we could handle all of their needs at a price far less than the other ERP offerings could. Their ROI from implementing Acumatica was exactly what they had hoped to receive when turning to an enterprise resource planning system. You may be interested in learning more about PracticeMax’s experience with Acumatica. Please read their full case study about successful ERP implementation. Because it’s important that expired, or almost-expired, Manufacturer’s Warranties are renewed, your service representatives are able to track warranty expiration dates via his or her phone, iPad, or laptop. He or she can then ask customers if they would like to renew or continue the contract while onsite, participating in growing this source of revenue for your business. While your field techs are onsite, additional corrective or preventative maintenance may be required. Instead of having to call dispatch with scheduling questions or to request the availability of certain parts or tools, the tech is able to get that information immediately from his or her mobile device. The customer doesn’t have to wait for someone to get back to them with how much it may cost and whether a part or tool were in inventory; the technician can take care of it right then and there, converting an unplanned need into a completed service and sale. Because of their cloud-based and mobile service management system, your service representatives can access a customer’s history of the services they have had done, parts they’ve used, and the warranties that apply to each part. Acumatica’s automated processes keep track of every detail, eliminating human errors, and increasing the profit margins for your business. With Acumatica’s Field Service Edition, your technicians can utilize the dictation application, saving them from having to upload their notes manually during their shift and reducing potential errors. This saves time and money. These are just a few examples of revenue opportunities and ROI as the result of your implementing cloud-based and mobile technology. Both your customers and your bottom line will appreciate them. Is your service business ready to implement a cloud-based, mobile ERP system? If it is, please contact us. Our end-to-end ERP system as a whole and our Field Service Edition in particular will not only provide you with a generous ROI but will give your field technicians updated, real-time information from any location on any mobile device, providing them with the ability to assist in increasing sales. Your customer service will reach new heights and profitability will be more than just a catch phrase. To know that we have our CRM integrated with our Accounting, integrated with our Project Accounting, is excellent. The increased productivity when we’re not doing duplicate data entry is a big deal.